Canine parvovirus is a very severe disease that affects dogs of all ages but is most serious in young pups and older dogs. The virus attacks the intestines causing bloodstained diarrhoea, uncontrollable vomiting, and severe abdominal pain. Dogs often die from severe dehydration despite intensive veterinary care. 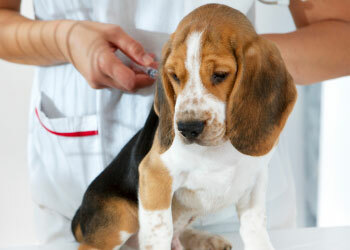 It is not necessary to have direct contact with other dogs for the disease to be spread. The virus is so persistent that the infected dog’s environment needs to be cleaned with a potent disinfectant (bleach) to prevent spread to other dogs. Even with that, parvo can survive within the environment for up to two years. Outbreaks occur regularly throughout Australia, especially in summer. Canine hepatitis is a viral disease that, like distemper, is extremely contagious and often fatal. Dogs of any age can become infected, however severe cases are rare in dogs over two years of age. Kennel cough is a condition produced by several highly infectious diseases, which can be easily spread wherever dogs congregate, such as parks, shows, obedience schools and boarding kennels. Among the infectious agents associated with canine cough are the bacterium known as Bordetella bronchiseptica and the canine viruses parainfluenza, adenovirus type 2 and distemper. Please note that there are many other viruses that can cause "Kennel Cough". If your pet is fully vaccinated and comes home from a boarding kennel with a cough, it is extremely unlikely to be one of the diseases listed above. Canine coronavirus is another contagious virus and causes depression, loss of appetite, vomiting, and diarrhoea especially in young dogs. Diarrhoea may last for several days in some cases. Although most dogs will recover with treatment, coronavirus has the potential to be fatal, especially if other infectious agents such as parvovirus are present. There’s an increased risk where high rat populations exist such as rubbish dumps or green sugar cane cutting areas. Incidence can also increase after long periods of wet weather, when rat populations are forced to move or concentrate. Leptospirosis is a zoonotic disease (an animal disease that can be passed to humans) who may then suffer a persisting “flu like” illness. Please note that we vaccinate for two different strains of leptospirosis (there are over 15) so if your animal has been vaccinated for lepto at another clinic, we may need to administer a booster of the second strain to ensure adequate protection. Canine tetanus is very similar to the disease seen in humans and is caused by the bacterium Clostridium tetani. Tetanus occurs when a dog gets a puncture wound of some sort and then bacteria living in the soil migrate up into that wound. Once the wound closes over, the spores from the bacteria are able to multiply causing symptoms such as difficulty chewing (lockjaw), a surprised facial expression, stiffness in all four legs, and hyperexcitability. Luckily, dogs are largely quite resistant to tetanus and we typically only recommend vaccination for those at extreme risk (ie. pigging dogs, etc. ).